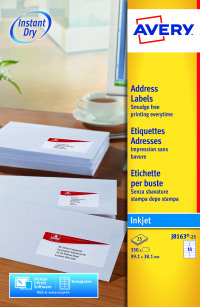 Print your address labels for letters and envelopes, quickly and easily using your inkjet printer. Avery mailing labels come with our special QuickDRY™ promise, ensuring smudge free results with your inkjet printer so you can confidently apply the label straight onto your envelopes without any smudge marks. Whether you’re printing in black and white or adding colour, these super white labels will look sharp and smart on your envelopes and small packages.